This weekend Occupy Wall Street celebrated its six-month anniversary, and as with any properly festive celebration, several dozen people ended up getting arrested by the NYPD. As the weather begins to warm in New York City, and as graduating college seniors begin to confront the painful reality of student loan repayment, we can expect more scenes like those of the past weekend. Paolo Mossetti of Through Europe has assembled a helpful primer for understanding the upcoming months. 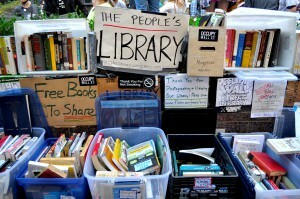 After the seizure of “The People’s Library” at Zuccotti Park last November, Mosetti asked leading writers, activists, and academics how they would repopulate the empty shelves. Part I can be found here, and in Part II we have a contribution from Simon Critchley and a recommendation of Aijaz Ahmad’s In Theory — both of whom are upcoming interview subjects for our Thinking the Present series. If I had to underscore any of the recommendations it would be Mark Fisher’s Capitalist Realism. Read our insightful interview with Fisher and you’ll see why.